Install 8 helical piles for a future boat dock within an existing lakebed; 32’ off the lake shore and in 12’ of water to a minimum depth of 15’ and 10 kip service load. The lake exists over what used to be a gravel pit and the Colorado Rocky Mountain weather was a factor for the scheduled installation date. 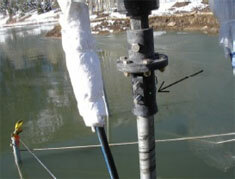 Installation hurdles included: Weather factors, installation on/in water, angle of approach to alignment for the boat dock in relation to its abutment. Keeping the pontoon boat still when setting up and adding pile extensions. Incorporate a combination of equipment including: 20’ Pontoon boat, 40’ maximum reach material handler with custom rigging for Pengo 12k hydraulic rotary torque drive unit with spill kits fastened on all potential leak points, and a skid-steer. Enough materials were loaded onto the pontoon boat to accommodate for 2 pile installations at the assumed minimum depth plus additional material for the water column prior to contacting the bottom of the lakebed. A combination of a 100’ vinyl tape measure and a single dot laser level mounted on shore were used to insure proper location during installation. Driving the furthest piles from shore made installation easier as anchored reference points were now available. 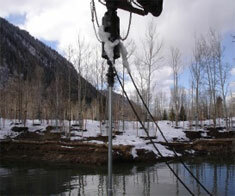 A 3 point anchoring system was used on the boat to maintain stability at each pile location. As each pile was completed this process came with ease now that we had our product to anchor to. Geotechnical Engineer: Hepworth-Pawlak Geotechnical, Inc.
General Contractor: Tenant Improvement Specialists, Inc. 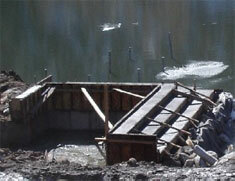 The Setup: Dock abutment, pontoon boat, skid-steer, material handler, vinyl tape, and laser level. Driving the piles: note the green laser dot reference on the right side of the drive head and the vinyl tape tied to the first pile for operator location reference.